The more things change, the more they truly do seem the same. Everyone has their own interpretation, based on your own life experiences. One of the wonders of being an older father with a younger child is watching how that young child grows and adapts to the world around her. I’ve talked before about her retro tastes in television shows from my own childhood: Batman, Three Stooges, Lone Ranger. But her new favorite airs at 7 a.m. and 8 a.m. Sunday. Does anyone remember Here Come the Brides? It ran from 1968 to 1970. It was a wholesome yet cheezy fairy tale about a logging operation in Seattle. There never seemed to be very much logging, and there certainly weren’t many weddings. Why should I note that? Because two points staked the show: To preserve their logging operation, the three Bolt brothers brought 100 women to Seattle to keep the loggers on task. What was the consequence? Town rich man Aaron Stempel fronted the Bolt brothers the money they needed to do it. But should any of the brides give up and leave town, the deal was off and Stempel would get the logging operation, the mountain (and 6 of Jason Bolt’s turtleneck and buckskin shirt outfits). I could go on about the plot, well not really, but the most fun comes from the plainly drawn characters and the utter impossibility of 100 women (never see more than a dozen or so at a time) who all wear immaculate plaid print long dresses, frilly matching bags, and hair stacked so high I’m sure they needed to duck under doorways. 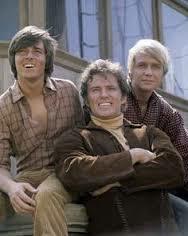 When the show aired, the fresh-faced youngest Bolt brother was played by Bobby Sherman. He was a teen idol in the late 1960s and early 1970s. Let me plant these tunes in your ear for a few hours: (Hey Little Woman … Julie Julie Julie Do You Love Me). Hardly the Justin Bieber of his day, though. If Sherman ever got in trouble, I’m sure the record companies and TV studios paid his way out and for secrecy. Sherman had steady TV work in low-profile roles and still has a fan club. (Peace, Love and Bobby Sherman!) He’s been married since 1971 to the same woman. I read that he turned 70 last year. Let that one soak in, Baby Boomers. I digress. As always. I think I could write a full post or two simply about Here Come the Brides. Let me squeeze in a couple brief mentions: Middle Bolt brother David Soul — Starsky & Hutch. Aaron Stempel — Sarek, Spock’s father in the Star Trek series, original and Next Generation. It goes to show the great diversity this actor had. What became of the turtle-necked male lead? A pretty under-the-radar career. One interesting degree of separation: Robert Brown (Jason Bolt) was Lazarus in a 1967 episode of Star Trek. He was a quick fill-in when John Drew Barrymore went MIA. Joan Blondell, the matronesque Lottie who kept an eye on the girls, was a Hollywood veteran. The innocence of this show is delightful. It’s G-rated, of course. It’s difficult to find G-rated fare outside of a kiddie channel or PBS (not that there’s anything wrong with that). Maybe they should have one of those TV reunion shows for the Here Come the Brides cast — at least the three Bolt brothers. Should we all look so good at 87.